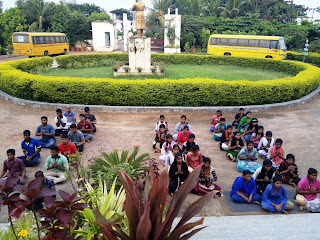 The Yuva Prashikshan Shibir organised in VISWASS campus at Pitapalli, from 23rd September to 26th September, concluded on 26th morning at 10.00 am. 32 selected youth (24 sisters and 8 brothers) from 4 colleges and 2 Universities participated in the training. Swami Pranarupananda ji of Sri Sarada Ashram, Uttara and Dr Amarendra Das, HOD Humanities Department, NISER inaugurated the camp on 23rd evening. Swami Aryananda, Seceretary Sri Ramakrishna Math Bhubaneswar; Dr. Dhirendra Nanda, State Secretary Swadeshi Jagaran Manch - Odisha; Dr Tarakant Nayak, Associate Prof. IIT Bbsr; Sri Ravi Naidu, Prant Sangathak - Vivekananda Kendra Odisha and Kumari Rashmita Nayak, Nagar Sangathak - Vivekananda Kendra Cuttack guided the participants in the lecture/group discussion/workshop sessions held during the camp. In the Group Discussion session, the youth discussed about - 1.) Challenges before the youth and their solutions 2.) Patriotism in Practice. Apart from the above, the participant trainees were given training in Asana, Pranayama, Meditation and Management games.